ww2dbaseMargarete Ilse Köhler was born in Dresden, Germany in 1906 to a factory foreman. Upon schooling in accountantcy, she got a job as a bookkeeper in the 1920s. In 1932, she joined the Nazi Party. In 1936, she married fellow Nazi Party member Karl-Otto Koch and was renamed Ilse Koch; they would have two sons together. In the same year, Karl-Otto Koch, who was the commandant of Sachsenhausen Concentration Camp near Berlin, Germany, hired Ilse Koch as a guard and secretary. In 1937, Karl Koch was made the commandant of Buchenwald Concentration Camp near Weimar, Germany, and Ilse Koch followed her husband there. In 1940, she oversaw the construction of an indoor sports arena, a 250,000-reichsmark project. In 1941, she was promoted to the rank of Oberaufseherin and was placed in command of other female guards at Buchenwald. She carried on an affair with SS medical officer Waldemar Hoven and deputy commandant Hermann Florstedt while at Buchenwald. In Aug 1943, both of them were arrested on the orders of police chief Prince Josias of Waldeck and Pyrmont for embezzlement and for the murder of prisoners who knew of their corruption. Karl-Otto Koch was found guilty and was ultimately executed at Buchenwald in Apr 1945; Ilse Koch was acquitted for lack of evidence. She went to live with family in Ludwigsburg in southern Germany, where she would be arrested by US authorities on 30 Jun 1945. She was tried at Dachau, Germany in 1947; among the crimes she was accused of was the harvesting of tattooed human skin for making human leather lamp shades and other household items. She was found guilty of violating laws and customs of war in Aug 1947 and was given a life sentence. During her trial at Dachau, she gave birth to a son; the father was unknown, but interrogator Josef Kirschbaum (who was Jewish) had been speculated as the father. In 1948, her sentence was reduced by US General Lucious Clay to four years, specifically noting that "there was no convincing evidence that she had selected inmates for extermination in order to secure tattooed skins, or that she possessed any articles made of human skin". In 1949, Koch was re-arrested and tried before an Assize Court of West Germany. She was found guilty of incitement to murder, among other crimes, and was given a life sentence. She committed suicide by hanging in Sep 1967. She was buried at Aichach in southern Germany. ww2dbaseKoch was nicknamed by Buchenwald Concentration Camp prisoners "Die Hexe von Buchenwald" ("The Witch of Buchenwald"). 22 Sep 1906 Ilse Koch was born in Dresden, Germany. 24 Aug 1943 Ilse Koch was arrested by the SS for corruption. 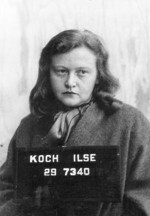 30 Jun 1945 Ilse Koch was arrested by US authorities. 19 Aug 1947 Ilse Koch was found guilty of violating laws and customs of war, and sentenced to life imprisonment. 8 Jun 1948 Ilse Koch's life sentence was reduced to four years. 27 Nov 1950 Ilse Koch's trial before the Assize Court at Augsburg, West Germany began. 11 Jan 1951 Ilse Koch fainted during her trial in Augsburg, Germany. 15 Jan 1951 Ilse Koch was found guilty of incitement to murder, incitement to attempted murder, and incitement to the crime of committing grievous bodily harm. She was given the sentence of life imprisonment and forfeiture of civil rights. 22 Apr 1952 Ilse Koch's attempt to appeal her life imprisonment sentence was dismissed by the Bavarian Ministry of Justice of West Germany. 1 Sep 1967 Ilse Koch passed away in Aichach, West Germany.